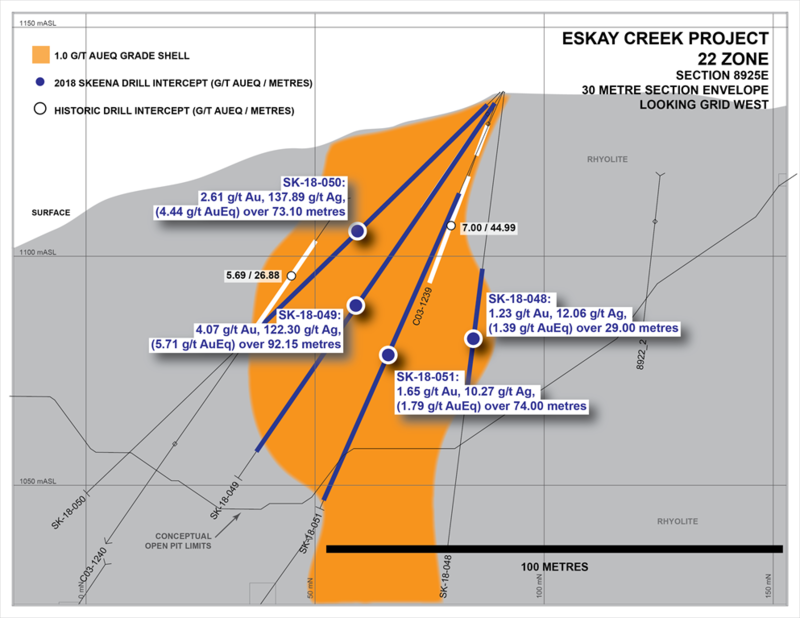 VANCOUVER, BC / ACCESSWIRE / January 24, 2019 / Skeena Resources Limited (TSX.V: SKE, OTCQX: SKREF) (''Skeena'' or the ''Company'') is pleased to announce final Au-Ag drill results for six holes from the recently completed Phase I surface drilling program at the Eskay Creek Project (''Eskay Creek'') located in the Golden Triangle of British Columbia. The multifaceted Phase I program was performed in the 21A, 21C and 22 Zones. Assays reported in this release are from the 22 Zone. Reference images are presented at the end of this release as well as on the Company's website. Gold Equivalent (AuEq) calculated via the formula: Au (g/t) + [Ag (g/t) / 75]. Core lengths are reported as true widths as exact zone geometries cannot be accurately determined from available drilling information. Grade capping of individual assays has not been applied to the Au and Ag assays informing the length weighted AuEq composites. Processing recoveries have not been applied to the AuEq calculation and are disclosed at 100%. Samples below detection limit were nulled to a value of zero. Originally outlined by limited surface drilling in 2003 and 2004, the 22 Zone is a tabular, sub-vertical, rhyolite-hosted feeder structure to the now eroded mudstone hosted mineralization typical of the Eskay Creek deposits. As such, mineralization within the 22 Zone is not enriched in the epithermal suite of elements (Hg-As-Sb) and is geologically and geochemically analogous to other non-deleterious rhyolite-hosted mineralization such as the 21C Zone and underlying mineralization of the 21A Zone. The 22 Zone currently has a drill-defined strike length of 300 m and horizontal width in excess of 50 m; it has only been tested in the upper 100 m at average 40 m drill spacings. Further drill testing will take place during the 2019 field season. Due to the paucity of drilling in this area, 22 Zone mineralization remains open for expansion along strike and to depth. 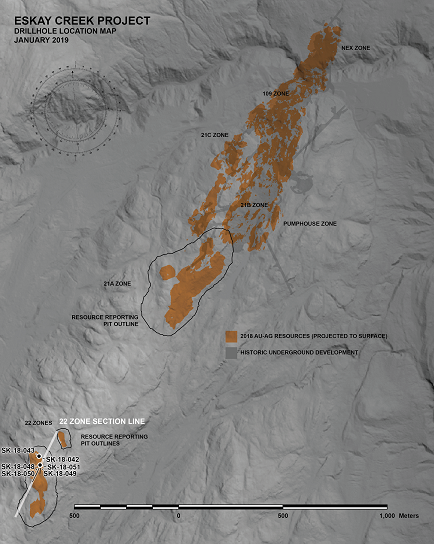 The 2018 pit constrained inferred resources hosted within the 22 Zone are comprised of 171,000 AuEq ounces (1.452 Mt grading 2.5 g/t Au, 89 g/t Ag or 3.7 g/t AuEq; for full resource details including indicated and underground resources, refer to the Company's News Release dated September 17, 2018). The 2018 Phase I drilling program was designed to infill and upgrade the inferred resources in the 22 Zone by increasing drill density to 20 m intercept spacing. Due to the onset of winter weather conditions, only six of the planned 20 holes were drilled. The outstanding portion of the program will be completed during the 2019 exploration season. This drill spacing will allow for future economic analyses and will also allow the Company to collect fresh material for an upcoming metallurgical characterization and testing program. Three drillholes were completed at the Company's 100% owned Snip project in Q4 2018. These holes were designed to test regional soil targets outside of the former mine footprint as well as to collect new lithostructural information to inform regional targeting for the 2019 regional exploration programs. No material assay results are reported. Certain statements made and information contained herein may constitute ''forward looking information'' and ''forward looking statements'' within the meaning of applicable Canadian and United States securities legislation. These statements and information are based on facts currently available to the Company and there is no assurance that actual results will meet management's expectations. Forward-looking statements and information may be identified by such terms as ''anticipates'', ''believes'', “targets”, ''estimates'', ''plans'', ''expects'', '' may'', ''will'', ''could'' or ''would''. Forward-looking statements and information contained herein are based on certain factors and assumptions regarding, among other things, the estimation of mineral resources and reserves, the realization of resource and reserve estimates, metal prices, taxation, the estimation, timing and amount of future exploration and development, capital and operating costs, the availability of financing, the receipt of regulatory approvals, environmental risks, title disputes and other matters. While the Company considers its assumptions to be reasonable as of the date hereof, forward-looking statements and information are not guarantees of future performance and readers should not place undue importance on such statements as actual events and results may differ materially from those described herein. The Company does not undertake to update any forward-looking statements or information except as may be required by applicable securities laws.